Cannon Street Station is a strange station. 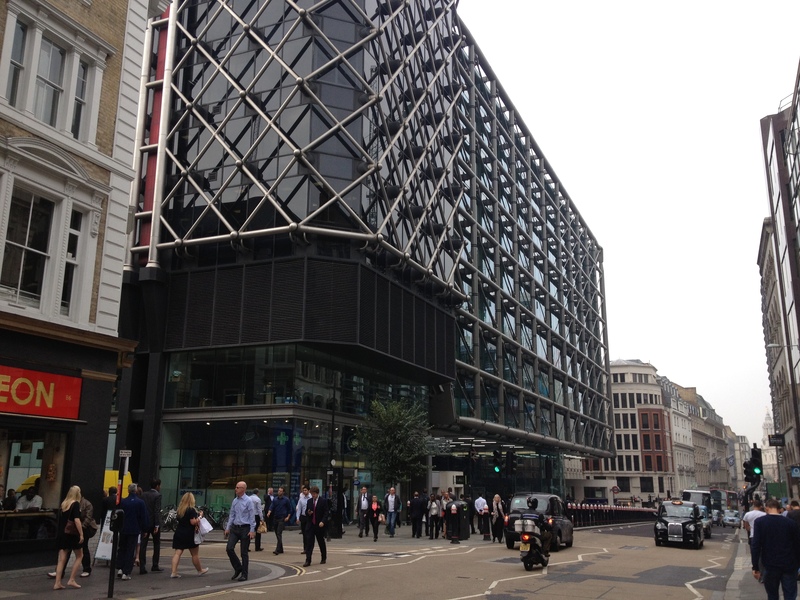 If you walk down Cannon Street the station appears to be hiding, pretending to be an office block and blending in with the other recent glass and steel office blocks that now make up so much of the City. 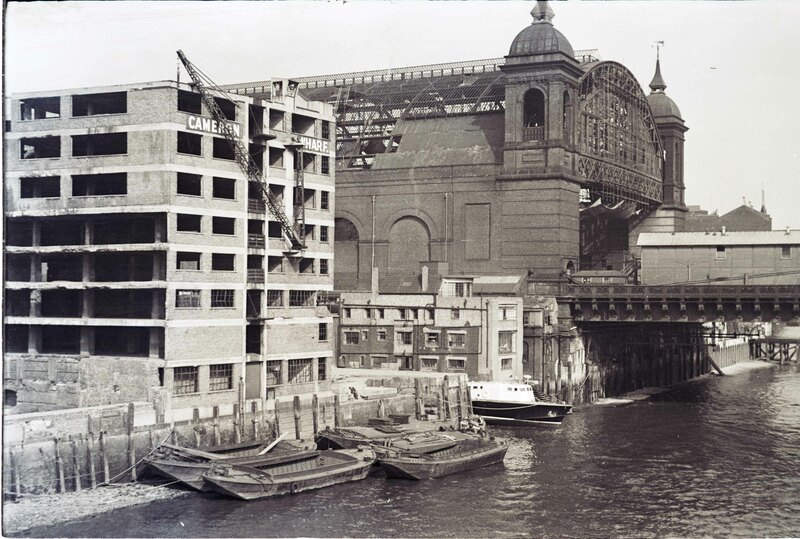 To find any real evidence of Cannon Street Station you need to head to Southwark Bridge where across the Thames you can view the rail bridge heading across the river and entering the station where it is flanked by two brick towers providing passengers their first glimpse of the London Terminus of the original South Eastern Railway. From this perspective the towers and the side walls remain, however the most significant change to Cannon Street Station is the roof. The original roof was glass on an iron frame that arched from side wall to side wall across the width of the platforms and ran the entire length of the station. The shape and length of the roof from the edge of the river to the station entrance made this a very significant landmark in the south of the City. 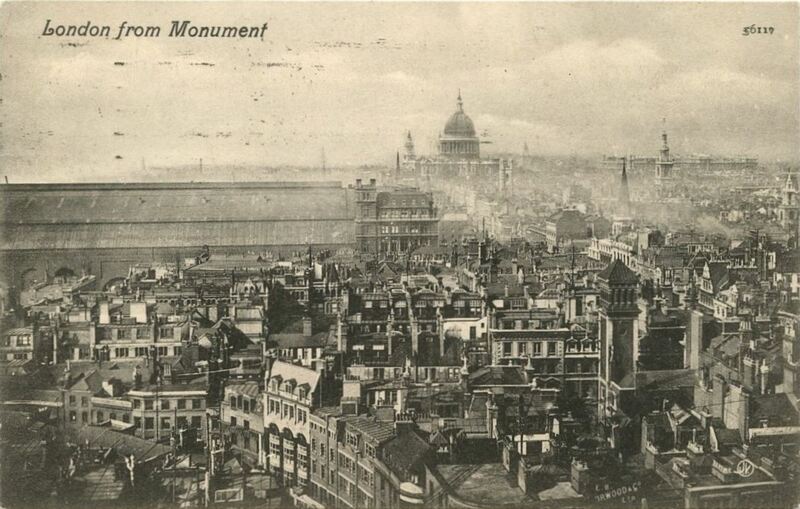 The following photo is from a postcard showing the view across London looking west from the top of the Monument. The size of the roof of Cannon Street Station and how it dominated the area is clearly visible. 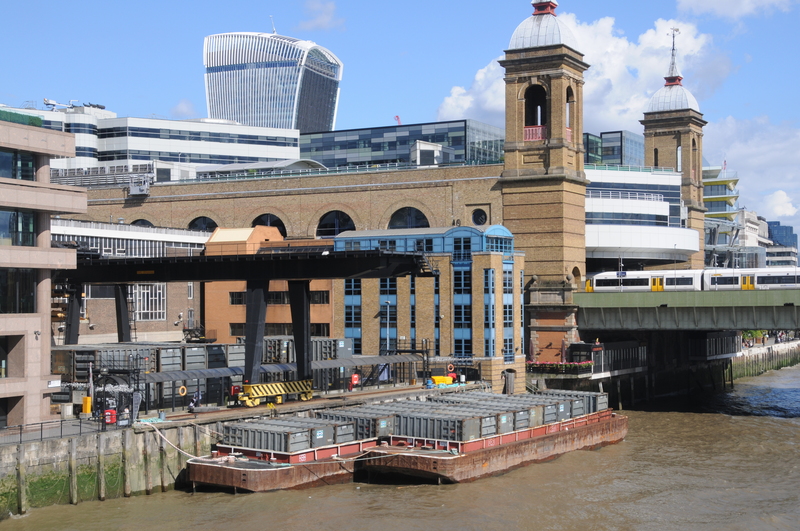 The Steel Yard derived its name not from the steel imported by the Hanse merchants, but from the King’s steel yard here erected to weigh the tonnage of all goods imported into London, the tonnage office being afterwards transferred to the City. Approval for the construction of the station was given through an Act of Parliament passed in 1861. Construction commenced in 1863 and the station was officially opened on the 1st September 1866. The station and bridge were designed by the Civil Engineers Sir John Hawkshaw and Sir John Wolfe Barry (who was also the engineer for the construction of Tower Bridge). The station serves suburban South East London, Kent and East Sussex. Due to pre-war neglect and damage during the war, the roof was demolished in 1958 and the hotel followed soon after in 1960. There followed a series of re-development projects across the station platforms and on the frontage to Cannon Street resulting in the station and offices we see today. Fortunately the towers facing the Thames are Grade II listed so at least what remains of the once magnificent building over and into the platform area is protected. Much of the brick wall on either side of the station that reached up to the base of the roof is still in place and provides a sense of the scale of the original station. 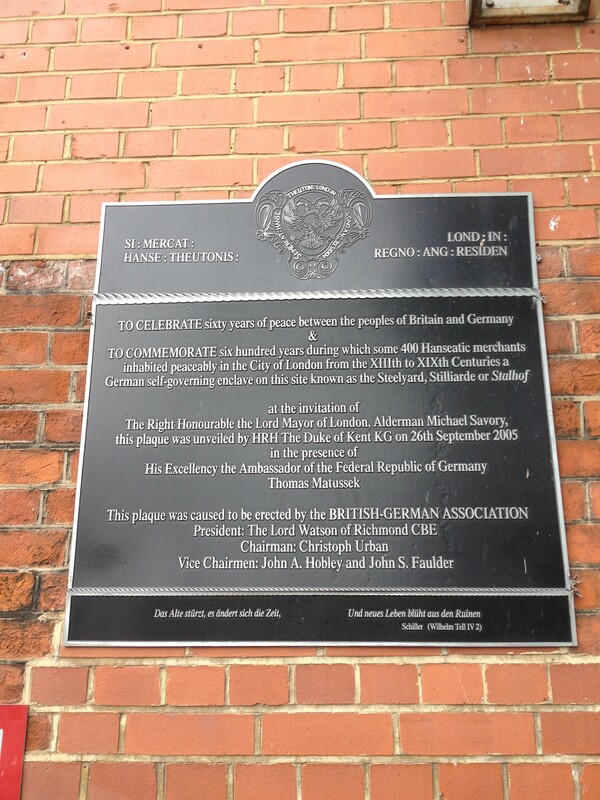 If you walk down to Upper Thames Street, then on the east side of the station, walk down Allhallows Lane along the side of the wall to the river, up a small set of steps and on the right is a plaque commemorating the German Hanseatic merchants who were based here in the Steel Yard for so many centuries. 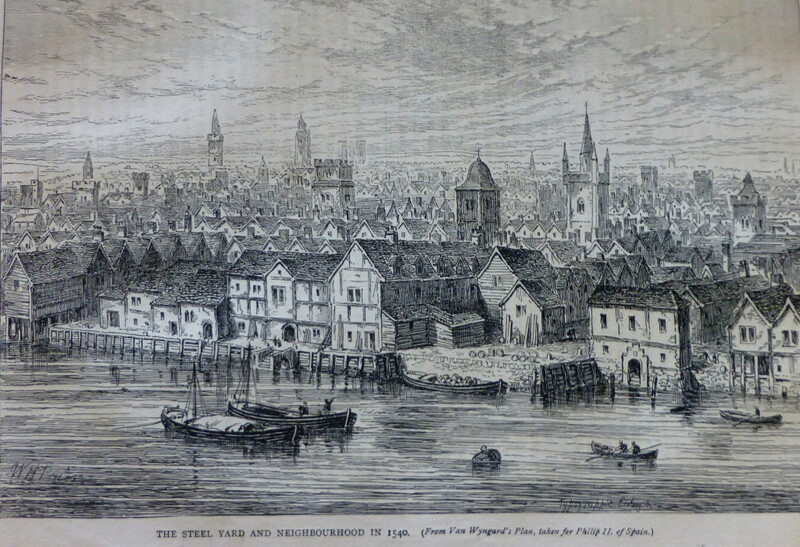 Cannon Street, after which the station is named, was originally Candlewick Street, first mentioned in 1276 and ran from Watling Street to London Bridge and was widened and extended to St. Paul’s Cathedral in 1853-4. 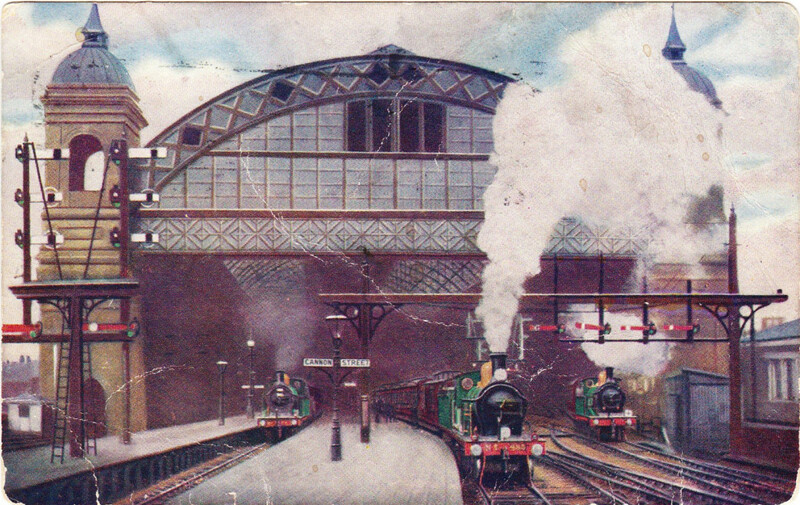 The original station buildings facing the road were in true Victorian station style. Along with the functions needed to support the station, the building also included the Cannon Street Hotel. 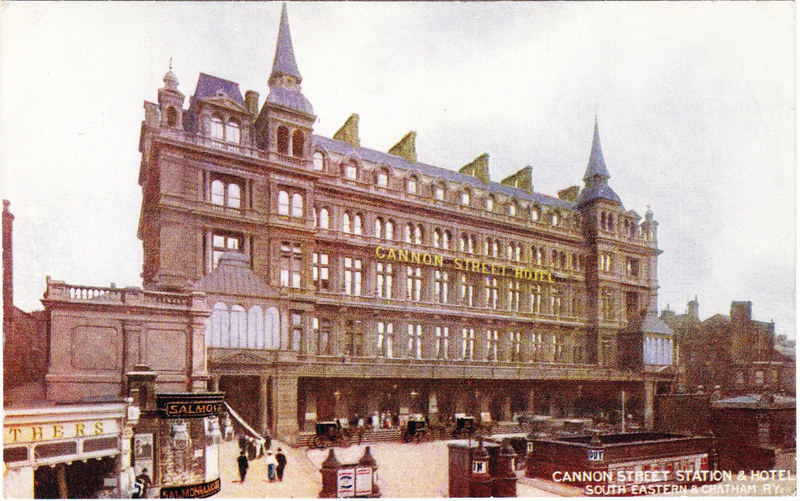 The following postcard shows the station and hotel building facing onto Cannon Street. The architectural style is very similar to that of Charing Cross Station. Note also the two towers that matched those facing the bridge across the river. 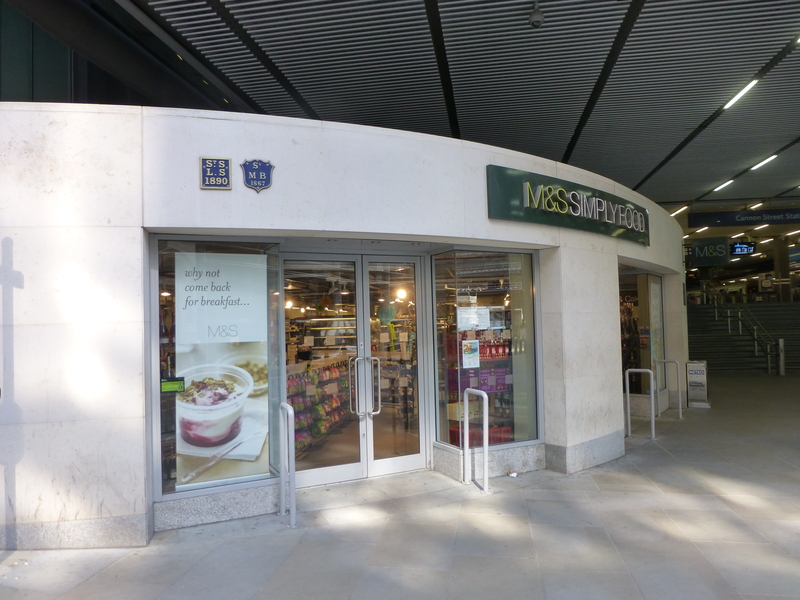 As I said at the start of this post, until you get really close and look at the ground floor entrance, would you really know that this is a station, or just another City office building? Walk past the station and you will see an M&S Simply Food shop to the left of the entrance. Above this are two parish boundary markers for St Swithin London Stone (the church damaged by bombing during the war and demolished in 1962) and St Mary Bothaw (this church was on the site of Cannon Street Station, but was destroyed in the Great Fire of London and not one of those selected to be re-built). Passengers arriving into Cannon Street Station would, if they could have looked directly into the station have seen the following view. Looking down into the station from this perspective gives an idea of the scale of the roof as it covered the length of the platforms from the edge of the Thames through to the station buildings on Cannon Street. Today, by London station standards, Cannon Street Station is relatively quiet. In 2012/13 there were just over 20 Million entries / exits compared to 95 Million for Waterloo (the busiest) and 38 Million for Charing Cross and unlike other central London terminus stations, Cannon Street is closed on Sunday’s (although this will change in 2015). A shame that this station hides itself in the street after which it is named, however at least the view from the Thames continues to provide a memory of this fantastic example of Victorian architecture and engineering. This entry was posted in London Transport, The Thames on September 21, 2014 by admin. I remember getting off of a steam train at Eastbourne Station with my Mum and Dad on way to visiting my Grandparents. As we walked past the drivers cab, I was unaware of a look between my Dad and the driver. As I was saying to Mum and Dad about how much I’d enjoyed the journey, hanging out the window and getting a sooty face, the driver set off the blasting whistle. It made me jump so much I must have cleared the platform. The driver and my Dad nearly wet themselves, and so did I, when I realised it was a set up I laughed myself silly. It is one of my earlies memories and I still smile when I think of it today!!! Thanks Jan, a lovely story. I’m lucky enough to work in the office building above the station, and from my desk I can see these two magnificent towers. You mention the original roof was neglected during the war. The story at work is very different. The rumour is that they were worried about the roof being bombed during the war, so moved all of the glass panels to a warehouse our of London, which was then ironically bombed and the roof destroyed. Not sure if its true or not. Apparently they were originally water towers, used for refilling the steam trains. I came here looking for a picture of what it originally looked like. Thanks for sharing those. Fascinating to see a picture from the same point so many years apart. The Sugar Loaf pub up the road has some good original pictures on the wall, as well as a story of Candlewick Street, if you are ever passing. That is a great location to work, the view across the river must be fantastic. You could well be right about the glass panels. That would make sense not to leave them in place. Not heard that the towers were originally used as water towers, but again that would make sense as there must have been a water storage facility at the station. I will have a look in the Sugar Loaf next time I am in the area. I came across your article on Cannon Street station when searching for information about St Mary Bothaw for use in family genealogy. Although the church may have been destroyed in 1666, I don’t think the graveyard was. I have found records of burials there as late as 1813, in the records of St Swithin, London Stone there are references to burials at St Mary Bothaw ground. I wonder whether the station was built on the site of the graveyard? The office block immediately to the right of the station, as you exit on to the street, was constructed in 1974 during the energy crisis of the time. Designed by engineers, rather than architects, to give maximum efficiency to the building. The subsequent recent remodelling of the station has obviously paid homage to this.